The reversible axial fans (Al) and bi-metal heaters (rust- and acidproof) are disposed in an inclined position in the DELTA system at the rear wall of the kiln opposite of the kiln door for front loading by fork-lift. The main advantages of this design consist of excellent circulation and uniform distribution of air and energy saving. Furthermore such design allows for reduction of kiln size which is a valuable feature when customer`s space is limited. The SECOMAT-1 is recommended for capacities of 5 - 80m3 of lumber. This type of kiln contains a ceiling fan deck. Fans and heaters are arranged above and on the side of this fan deck. Such design is used mainly for large sizes of dry kiln with capacity above 80m3. Also this type provides for exellent air circulation and uniform climate inside the kiln. The Lumber Dryers SECOMAT are designed and built in modular system as self supporting sandwich construction, exclusively of aluminum and rust-proof materials. This avoid any corrosion and keep the kiln maintenance free. 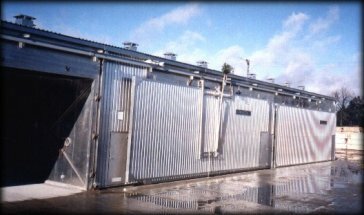 Walls, roof and doors are manufactured of aluminium panels, which are twice flanged on each side, on top and on bottom and screwed together to give it ernormous strength. This unique design of wall and roof of the SECOMAT allows for optimum 100 mm thick insulation of incombustible and environmental friendly mineral wool board. The panels are sealed by silicon and covered by trapezium-shaped aluminium sheets on the outside. 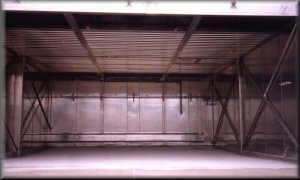 The range of kiln-size is from 5 - 250m3 with door openings up to 16m without filling peats. Basic design of SECOMAT includes lifting-sliding door. Swing door, folding door or hydraulic door are available. Each kiln has separate service room conataining electric devices and computer (in cabinet), for process control as well as heating and spraying valves. Multi-compartment dryers are arranged in row and are conected by common walls. They have a common service room containing also heating and spraying collectors. The reversible axial FANS (Al) with direct connected motors (insulation class H) are resistant against high temperatures, moisture and aggressive kiln environment (acids). The motors have stainless steel shafts, lifetime lubrication and are tightly sealed. They are direct connected to the fans. The motor housings are made of aluminium too. Fan size and motor power are assorted for kiln size to provide proper amount and air speed. Bi-metal HEATERS consist of boiler tubes on the inside (for better heat transmission) and aluminium finned tubes on the outside and are acid proof protected by stainless steel sleeves and colectors. Stainless steel inside tubes are possible (optional). The heating and spraying pipes and flanges are made of aluminium and stainless steel too. Everything is resistant against temperature, moisture and acids. Size and quantity of heating system is to provide fast and sure heating-up to drying temperature. Heating and spraying VALVES as well as distributing COLLECTORS are arranged in the service room, which contains also electrical cabinet with built in computerized control system. MC-PROBES (5) mesure the moisture content of the lumber. They are connected to the data-processor SECODATA by Teflon insulate cables and transmit these data to the data-processor. THERMOMETER and EMC (Equilibrium Moisture Content) sensors mesure the drying air temperature and air humidity (EMC) by cellulose tissue inside the kiln. Computerized process controler SECOTRONIC is enclosed in the electrical cabinet. It controls the drying process according to the program for certain species of lumber. 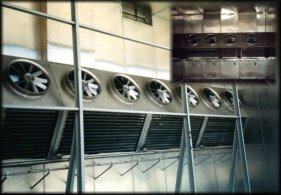 Drying process is divided into following phases: heating-up, six drying phases, conditioning and cooling down. All data for basic as well as customer selected lumber species are stored in computer memory. Process run can be selected from programs stored in computer memory or pre-set according to individual customer requirments. SECOTRONIC provides efficient drying of lumber without risk by high quality and yield factor and optimal drying time. DATA-PROCESSOR SECODATA receive the high "Ohm" resistance from the 5 MC probes and changes these into digital values and transmit them to the CPU of the Computer SECOTRONIC without any external influence.